While we can’t stop winter and snow, there are a few things you can do to minimize its impact on your landscape. 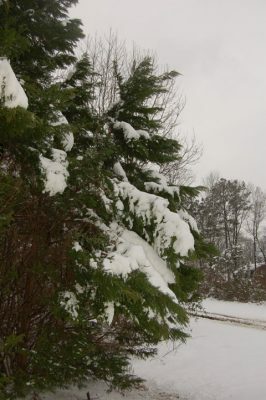 Narrow, upright evergreens with multiple leaders, such as arborvitae, upright junipers, and ‘Sky Pencil’ holly, are extremely prone to disfigurement under heavy snow loads. Tying branches together before it snows can minimize this type of damage. This can be done by ringing the outside of the shrubs with rope or narrow strips of cloth or by tying the main leaders together high up inside the shrubs. Just remember to remove binding materials after the snow has melted. Leland cypress is another evergreen prone to damage. Branches may break or split from the weight of snow or ice or whole trees may topple due to the poor root structure common to this variety. Little can be done to prevent damage to Leland cypress. The best advice is to remove damaged specimens and replace them with stronger, more resilient species such as ‘Oakleaf’, ‘Nellie Stevens’ or ‘Needlepoint’ holly. The angle at which a branch is attached to a limb or trunk is known as the crotch angle. The narrower the angle, the weaker the attachment and the more likely that branch is to break or split. Some trees naturally form lots of narrow crotch angles, making them extremely susceptible to breaking in snow and ice. ‘Bradford’ pear is the classic example of this type of weakly structured tree. It is too late to correct structural problems in mature trees. However, pruning and training young ornamental and fruit trees to promote good structure will increase their life span and improve survival rates in future storms. This practice, which severely shortens all of the large branches of a tree, is extremely damaging and weakens tree structure. If topping is your only option, the better choice is to have the tree removed and replace it with a stronger species. 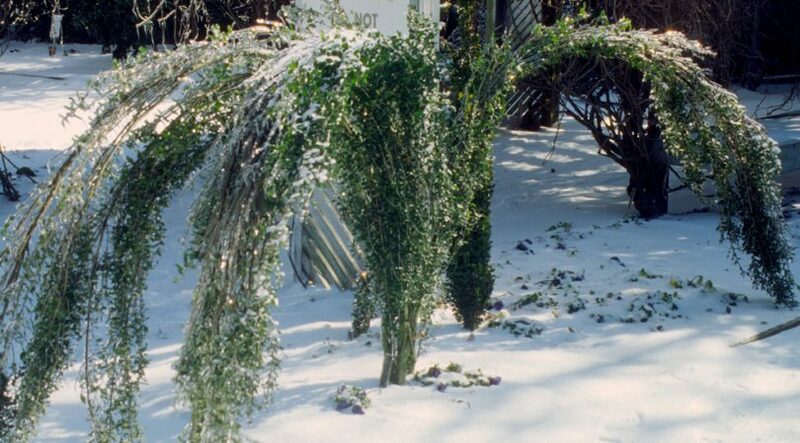 De-icing salts can cause serious damage to the roots and foliage of landscape plants. As snow melts, salt enters the soil, where it damages both soil structure and plant roots. Salts can also be splashed onto the leaves of evergreen plants by passing vehicles. The best way to minimize salt damage is to avoid using de-icing chemicals that contain sodium chloride (NaCl). Several alternative products are available, though they are typically more expensive. Products containing potassium chloride (KCl), calcium magnesium acetate (CMA), or calcium chloride (CaCl2) are much less likely to damage plants when properly used. Coarse sand and sawdust are also simple, natural alternatives that will help provide traction on slick surfaces. Plants growing within 30 feet of treated surfaces are most likely to be affected by de-icing salt. If your evergreen plants are exposed to sodium chloride laden spray, rinse the leaves with plain water as soon as possible after exposure when temperatures are above freezing. If salt soaks into the soil around salt sensitive trees and shrubs, leach the soil by slowly saturating the area with plain water. This is best accomplished by allowing soaker hoses or drip irrigation to run in the area for two to three hours. Landscape plants sensitive to soil borne salt include white pine, red maple, boxwoods, river birch, and pin oak. Featured image by the JC Raulston Arboretum.